Fully automatic laminating system that is available in a short run bottom feeder versions, as well as a longer-run production unit. The Komfi Amiga 52 features a specially-designed Komfi® feed head and deep pile feeder. The Amiga 52 is a flexible laminating machine, capable of processing small-volume jobs as well as middle-volume jobs up to B2 sheet format. 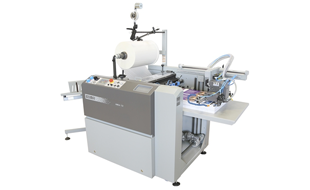 Features top suction automatic sheet feeder, and automatic sheet separation using built-in perforator. Laminating cylinder heated by infrared heater. Interested in the Komfi Amiga 52? Contact us to see how this Celloglazer can help your business!